As one of Denver's premier custom homebuilders, Larsen Development designs "dream homes" tailored to the unique needs of the individual client while making the building process a seamless and stress-free experience. Every detail matters when you embark on building a custom home. Our clients are individuals who want the experience, skill, and diversity of an award winning architectural design team who is dedicated to the utmost in customer service and satisfaction. At Larsen, we cater to those who want every advantage of an in-house interior design staff, a quality control program that helps them build with confidence, and upfront malleable budgets that align with their wallets. 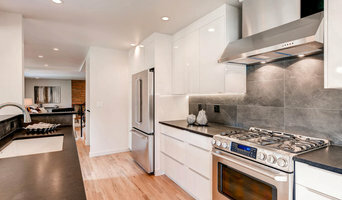 For our clients who want to build smart, energy efficient homes that fit Energy Star standards, we construct every unique residence with the high-quality finishes and energy efficient products that Larsen Development homes are known for. All while providing the personal attention and unique designs that have set our homes apart from other builders for more than 35 years. Every single one of our clients wants to build homes that reflect our years of experience and embrace the Larsen Standard of service and quality. Give us a call and see what one of Denver’s premier home builders can build for you. Building Homes Is Not Only My Profession But Also My Hobby. When Honesty & Integrity Matters! Gunlock Homes is a full service home builder and general contractor of fine custom houses in Denver's highly desirable neighborhoods, including Country Club, Hilltop, Cherry Hills Village, Wash Park, Platt Park, Observatory Park, Belcaro, and Cory Merrill. We are experts in building single-family homes as well as large, custom renovations such as pop-tops and multi-story additions. As a Class C Residential Contractor in the city and county of Denver, owner Brad Gunlock personally plans and manages each project to ensure that the craftsmanship and pricing meet his exacting standards. We are fully licensed and insured, and provide a one-year limited warranty on all materials and workmanship (effective from the date of completion). Interested in working with Gunlock Homes? Contact us to find out how we can turn your new home into a sanctuary that is also a functional gathering place. Custom home builder focused on providing timeless homes to the Denver metro clientele. The owner, Tony Zangoglia, is a former U.S. Army Engineer Officer and Aerospace Quality Assurance Engineer. If you purchase a home from Sunnyside Builders rest assured you are moving into a home which was meticulously planned, built with owner supervision, and made to last for generations. Sunnyside Builders is actively looking to build your next home or duplex! From historic homes to modern spaces, we work as partners with our clients to create highly personalized spaces that can adapt to the changing needs of every family. LeavittHaas is a residential design/build studio. We work with homeowners and builders in the greater Denver, CO metropolitan area. Our goal is to design our clients' homes, additions, kitchens, bathrooms or exterior spaces with an eye not only to aesthetics but also to ensure a home's ergonomics fits today's modern lifestyles. Using 3D renderings, the company allows clients to "walk" their project before construction begins. This allows clients to get a feel of how the home will flow - and where key features will be at - prior to any building taking place - saving time and money in the long-term. A founding principle of the company is to look at the house as a whole during design and then stage construction in phases in order to achieve the clients dream homes. Some clients only have one small project, while others realize that all interior and exterior projects need to be taken into account before the first step to their dream home has begun. Fish Builders of Colorado, Inc.
Lite beroende på vilket hus man vill ha och hur det ska se ut är det mer eller mindre svårt att skissa upp det själv. Idag väljer många att bygga passivhus vilket är en samling byggtekniker för att skapa energisnålahus, här kan det själv vara svårt att komma upp med rätt konstruktion. Man behöver ta hänsyn till tomtgränser vilket görs genom lantmäteri, byggteknik och hur man faktiskt bygger ett hus från grunden när man ritar upp sitt hus. Därför kan det vara smart att använda sig av en byggingenjör eller fritidshustillverkare i Denver för att få till ett stabilt och snyggt hus. Då kan man själv fokusera på bygganmälan och annat pappersarbete kring bygget. Tar man hjälp kan man dessutom få ett riktigt fint arkitekthus. Arkitektritade hus blir ofta fantastiska och med många kreativa lösningar. Hur ska man välja hustillverkare i Denver? Som tur var har vi många hustillverkare i Denver, CO att välja mellan. Men visst kan det medföra svårigheter. Bestäm dig för vilken typ av hus du vill bygga. Är det ett lösvirekshus eller nollenergihus? Man bör även fundera över budget. Letar man efter billiga hustillverkare måste man vara på det klara om vad som kan levereras. Priset bör inte gå före funktion och kvalitet. Är man ute efter ett specialritat hus ska man vara medveten om att arkitektritade villor generellt brukar dra iväg i pris.